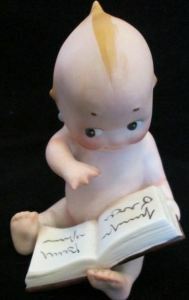 Kewpie dolls by Rose O'Neill - the first Kewpie dolls were illustrations created by Rose O'Neill in 1909 for the Ladies Home Journal magazine,. On November 4, 1913 a patent was issued in the USA to design and make the actual dolls, these early Kewpie dolls are all bisque and made by German manufacturer's Kestner, plus others and may bear their company marking or are unmarked. Authentic licensed Kewpie dolls all have blue tipped wings, were made of high quality materials, have star shaped hands, came with a paper label that could now be missing, many bisque Kewpies are incised on back Rose O'Neill or bottom of foot © O'Neill (Action Kewpies), licensed Kewpies were never made in Japan or marked Nippon. Kewpie dolls have been made by many different companies over the years and in a variety of materials and products; all bisque dolls or figurines, also made of plastic, vinyl, composition, celluloid, cloth, books, plates and other paper products by: Amsco, George Borgfeldt, Cameo, Effanbee, Japan, Jesco, Knickerbocker, Kruger, Lefton, Strombecker, Shackman and others.